Fine words from our favorite customers. Hearing positive feedback from our customers is one of the best parts of our job. 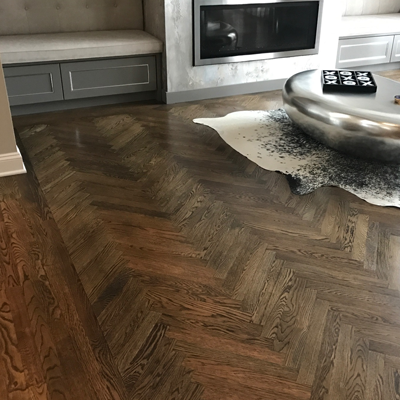 At Artisan Wood Floors LLC we take great care to educate and inform our customers about everything that goes into a flooring installation or refinishing. Nobody like’s strangers working in their home so we strive to build trust and open communication with our clients in order to help the process finish smoothly. 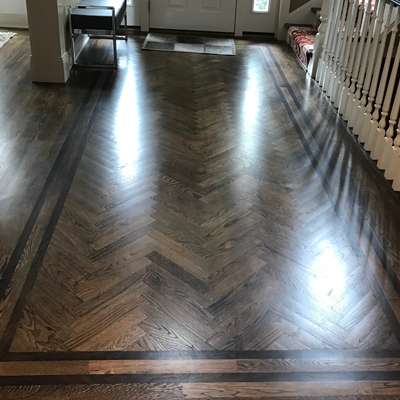 “Steve and his team at Artisan Wood Floors recently refinished floors on 3 levels, including 2 staircases, in our row home and they turned out beautifully! Steve was very accommodating and completed the job in a short window of time between our closing date and move in date. “Steve led me through the process of getting new floors for my older house in Fairmount. Answered all of my questions that ranged from the benefits of just one small repair to getting all new floors. Steve is a master craftsman of floors and was a gracious and patient guide while I decided on installing floors on the first floor. He met us at the local flooring shop (Bell Flooring), and talked us through the different options. I was amazed at the transformation shortly after he was done that I scheduled him to do my second floor. Steve has a terrific attention to detail, and no question is too silly. No more splinters or gaps from the original floors! Instantly adds value, stability and comfort to the house! My mother, who was living in the house throughout the installation, praised Steve and his team of two installers, who were mindful of where their methodical and precise. The finish is beautiful. The only maintenance is light mopping with a damp cloth. The new floors are laid right on top of my original floors, and the house has a much tighter feel. There’s a moisture barrier laid down first and the floors need to have the correct moisture level before Steve starts. I’ve learned a lot about installing wood floors throughout this process thanks to Artisan Wood Floors. 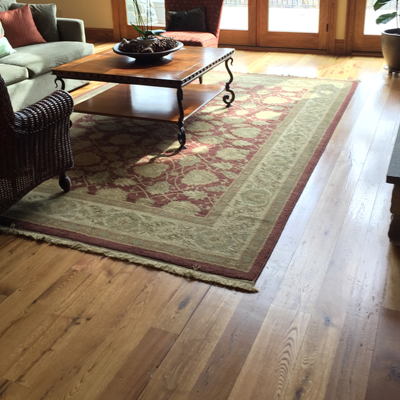 “Steve and his team refinished all the floors in our 1900 square foot house. Some of them had been painted over and others were pretty scuffed up. 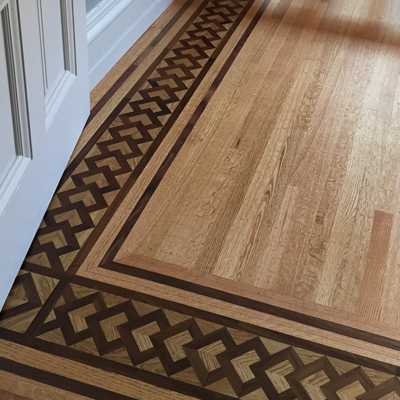 “We recently had the floors (& stairs) in 3 first-floor rooms restored/refinished in our 1920’s row home, & we are thrilled to have worked with Artisan Wood Floors. We have parquet floors, with a border. Over the years several areas were worn down & even broken. Some of the parquet had to be completely replaced. Steve was able to identify the type of wood & replace/repair several sections. He was able to match the stain in the border pieces as well. We were highly impressed with this company from the planning through each stage in the process. We are thrilled with the finished product & are loving having beautiful floors! 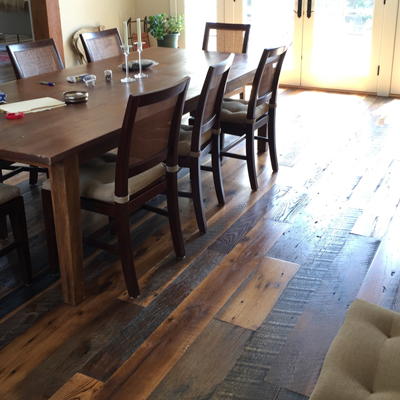 Artisan Wood Floors is an amazing company. Steve & his team are all very talented. They work well together, and communicate effectively with their clients. They are punctual on their work days, & checked in with us each day. They also cleaned up every day as well. They were committed to finishing our floors in a very timely manner, & were also flexible with scheduling. “Love Steve and his crew! They did an amazing job refinishing pine flooring in our new house in Manayunk. This is the second time we have had them do our floors. Every client of ours brings unique challenges and needs to their hardwood flooring project. Whether it's intricate pattern or border work, or simply a standard installation it's great to see the finished results. Take a look at some of our favorite projects in Philadelphia and NJ below. contact you in order to gain a better understanding of your project and provide you a quote.